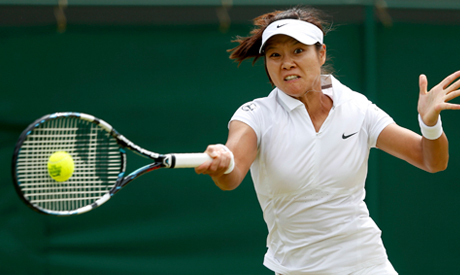 Li Na routed Roberta Vinci of Italy 6-2, 6-0 Monday to reach the quarterfinals of Wimbledon for the third time. The 31-year-old Chinese player broke the 30-year-old Vinci six times to wrap up the win in just 55 minutes on Court 3. The sixth-seeded Li will next play the winner between No. 4 Agnieszka Radwanska of Poland and Tsvetana Pironkova of Bulgaria. The 11th-seeded Vinci was trying to make her first Wimbledon quarterfinal, having also reached the fourth round last year.